Example Scenario : "It is my first day of work in the Investment Bank and I have to take over my predecessor's model. My boss says that the model has external links to the local hard drive where some other numbers were stored. I need to find these in the model quickly"
Savvy solution : "Use Savvy Find on the model to search through all the formulas for the phrase "C:\". Once the search is complete the results are displayed and the external links in formulas will be displayed. Identify these in the model and follow the logic from there." Example Scenario : "I have been given a model for a French water company, I need to delete the FranceResult output worksheets, how can I tell whether this will have an impact on other parts of the model?" 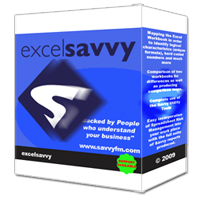 Savvy solution : "Use Savvy Find on the model to search the formulas for the word FranceResult. Once the search is complete the results are displayed, from the results you can see whether there will be any impact on the model in deleting the FranceResult worksheet. (note it is worth checking the names as well)"